Collaboration with Mike Sudduth, whose illustration blog you can find in my links list on the right. An education prof at Winthrop is writing a book about teaching, in which she has an exercise/worksheet on characterization for English or literature classes from elementary to middle school ages. 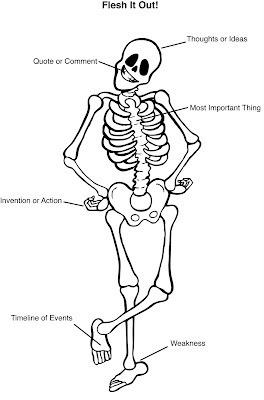 The thing is called "Flesh It Out" and the students are to flesh out a character starting with the skeleton. She had been talking to a studio in NYC who was giving her exactly what she told them she didn't want- their skeletons were scary, ugly, and not right, and they just weren't taking the time to listen to what she wanted (which was a fun, non-scary, simplified, friendly skeleton with thick enough lines that it could be xeroxed many times without losing anything).